This Is the Story of a Happy Marriage is an irresistible blend of literature and memoir revealing the big experiences and little moments that shaped Ann Patchett as a daughter, wife, friend and writer. Here, Ann Patchett shares entertaining and moving stories about her tumultuous childhood, her painful early divorce, the excitement of selling her first book, driving a Winnebago from Montana to Yellowstone Park, her joyous discovery of opera, scaling a six-foot wall in order to join the Los Angeles Police Department, the gradual loss of her beloved grandmother, starting her own bookshop in Nashville, her love for her very special dog and, of course, her eventual happy marriage. 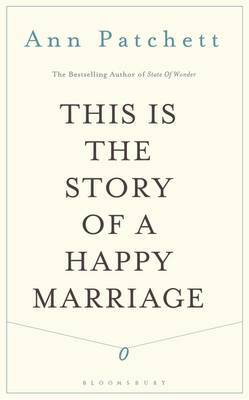 This Is the Story of a Happy Marriage is a memoir both wide ranging and deeply personal, overflowing with close observation and emotional wisdom, told with wit, honesty and irresistible warmth.